Whether you are a rural Quebec farmer or an urban Muslim student, you ought to have a candidate and a government that speaks to you. New Democratic Party federal leadership candidate Jagmeet Singh speaks a meet and greet event in Hamilton, Ont., July 17, 2017. Picture taken July 17, 2017. There's a cynicism, a rot, hidden in the very core of our democracy. Ringing across front porches from Hamilton to Halifax, five simple words undermine our democracy: "All politicians are the same." When I hear these words, I understand the cynicism and disdain. Like many Canadians I haven't felt reflected in any of the major parties, their politics or their party leaders. I saw too many of our communities kept out of the political process, instead restricting decision-making to an elite class often steeped in multigenerational family ties. Politics in Canada is literally a "family business." Canadian Prime Minister Justin Trudeau, July 14, 2017. As a councillor elected to serve the City of Hamilton, I proudly campaigned as an independent, unconstrained by partisan loyalties. I simply set out to do what was best for my neighbours — build a safe and vibrant community full of opportunities for everyone, regardless of their postal code. Once in office, I was faced with the stark realities caused by decades of legislated poverty. This government has demonstrated the type of neo-liberalism that places profits over people. In our Steel City, nowhere is this more pronounced than the free-trade agreements negotiated by our governments. Governments have continued to negotiate free-trade agreements that have benefited corporations and shifted the tax burden away from big business onto residents and neighbours. While Ottawa struck deals to benefit the owners of Stelco and Dofasco, the workers who built our Steel City are left here at home with an uncertain future filled with bankruptcies, lockouts and pilfered pensions. Hamilton, Ont. is home to hard-working industries. Their "sunny ways" have still not trickled down to the vulnerable residents I serve in the heart of our city, nor has this government stepped up to do the right thing and help the pensioners who have been secretly dealt away by the Conservative government under CCAA. The Trudeau Government has kept the status quo and continued many of Harper's policies on climate change. By favouring big oil corporations over the health of future generations, this government has demonstrated the type of neo-liberalism that places profits over people. It's not good enough to have a Liberal government that speaks a language of justice and reconciliation only to turn around and continue to uphold Conservative policies that further Indigenous oppression. Real Change is not continued Liberal support for Bill C-51 that militarizes our local police and creates a state where the Canadian public is enemy No. 1 while eroding our Charter and environmental rights. So, why did I sign my first party membership card a few weeks ago to support Jagmeet Singh as leader of Canada's New Democratic Party? As the first person elected to council of African Canadian descent, I made my decision to support Jagmeet Singh long before he declared himself a candidate in the federal NDP leadership race. 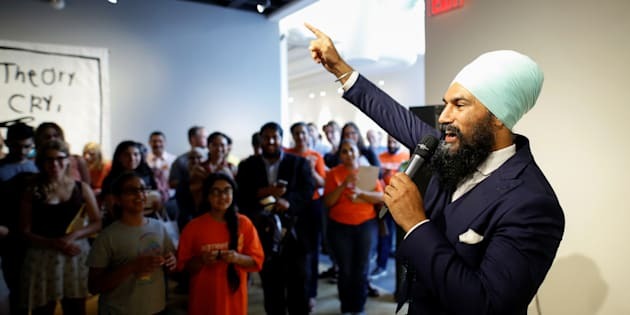 I made the decision to support Jagmeet's leadership when he stood up in the Ontario Legislature and called for an end to the policy of carding before it was popular for elected officials at any level to do so. Some people may say that is all about identity politics. But I can tell you that all politics are identity politics. Whether you are a rural Quebec farmer or an urban Muslim student, you ought to have a candidate and a government that speaks to you, and even more importantly, understands and listens. He shares his power and his leadership with those who would have never been welcomed before. So, how are we to know when the real deal comes along to lead us? In recent years, the federal NDP has struggled to reconnect with its grassroots. For many, the party born out of the labour movement has felt disconnected from working-class Canadians. It takes attracting folks who have never been a part of the political system. And it takes persuading Canadians to rally behind the kind of leader who demonstrates progressive values in the process of their campaign as well as in their policy. So I say, don't tell me about your politics, show me. I am supporting Jagmeet because he engages people who have never participated in our organized political system before. He listens. He shares his power and his leadership with those who would have never been welcomed before. By growing the NDP, Jagmeet is growing our democracy. It's easy to sit idly by and watch as the system we built erodes our values. It's easy to sit on the sidelines and simply critique our system's faults. What's difficult is to act. To call your friends, your neighbours, and your family and talk about the issues that are truly holding our country back. To talk about systemic racism, to talk about inequality, to talk about our environment, and to do something about it. That's why I signed my first party card to support Jagmeet Singh as leader of Canada's NDP.